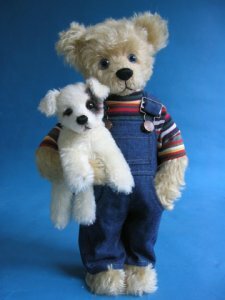 16" Austin made from long golden tan mohair wears his denim overalls and striped knit shirt. Arms are fitted with armature so the arms bend so he can hold Mo.Beige suede paw pads. Hand painted blue pupil eyes. Fully jointed. 7" White mohair with black air brushed spots Jack Russell Terrier puppy, neck jointed, body softly stuffed with pellets and poly.